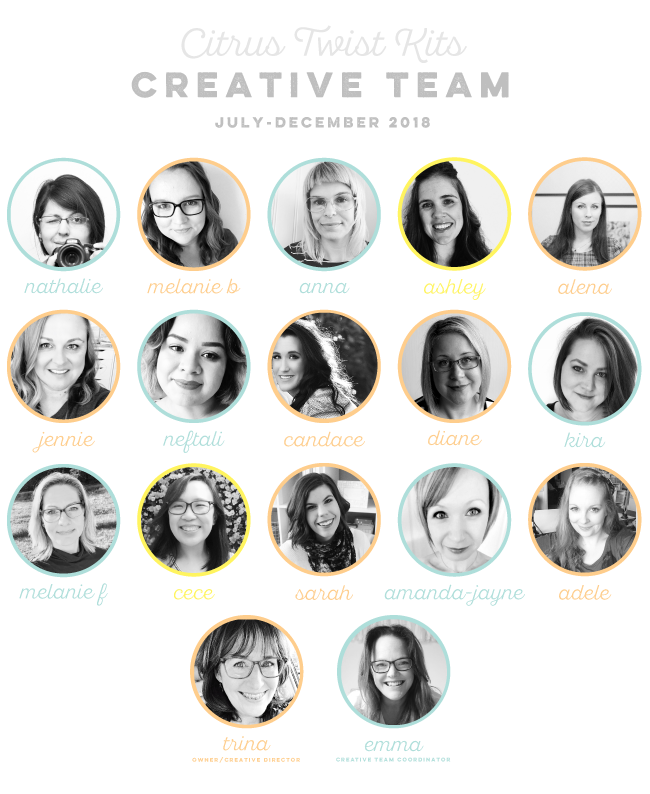 Citrus Twist Kits | Blog : Meet our Creative Team! The projects from these creatives will begin appearing on our blog, Facebook fan page and on social media on July 1st (if you haven't already seen some of their sneaks!) Our July "Skyland" kits reveal at midnight PST on June 30 (or July 1, as the case may be). We welcome you to meet the team! We thought we would have fun with the introductions of these creatives and have them answer a few questions. You may just see some of their personalities emerge as you read their answers! Never Been Kissed, 17 Again and Inside Man...a strange assortment indeed! Europe! I have always wished to visit there and fingers crossed that one day I am able too. I would love to experience the great variety of culture throughout Europe. The ability to teleport, it would make traveling so much easier and stress free! Oooo this is very tough!! I’d have to say heart stickers, I can always change the size, colour and pattern to suit my project. I love the detectives of Agatha Christie. I dream to go to New York. I would like to stop time sometimes. More often I work with glossy photos. 3 movies I love: The Hunger Games trilogy, Harry Potter and The Notebook. I don't know if it's a super power but it super hard for me though,lol! To be more PATIENT. So hard...maybe puffy stickers? Or enamels? To look at a room & make it clean with my mind! Glossy - wait, have I been missing out on a matte photos in my life? I need to try Matte next time! Square - i love clean lines. I've been desperate to go to Japan since I was 16 years old and it's finally made it onto our long-term goal list! Superpower? I'm not sure but I'd love to be able to cure headaches! Stamps for sure, if I was only allowed one crafty thing for the rest of time it would be stamps. SO versatile. I switched to square corners a couple of years ago and I'm never going back! I can't even mixed them up, it has to be all square, all the time! I love books and I tend to follow authors who write series – some favourites: Patricia Cornwell/Kay Scrapetta series (crime), Matthew Reilly/Scrarecrow series (thriller) and Cassandra Clare/Mortal Instruments (I know technically classed as young adult fiction and I’m way above that, but I really enjoyed them lol). Egypt and see the pyramids firsthand. Hmmmm....to be able to teleport! Harry Potter series (#4 is my favorite), Princess Bride (the book, the movie is slightly “meh” to me) and any book by David Sedaris. There’s so many places! But number one on my list is Italy. I don’t know that I have a preference, but I use glossy. The Time Travelers Wife (book & movie) , Benjamin Button (movie) and Circle of Friends (book)! Scotland!! We have a Scottish heritage, I would love to see that beautiful country! I would love to slow down time because some moments go by way too quickly for my liking! Stamps!!!! I’m on a serious stamping kick at the moment! Matte!! Better for stamping directly on pictures! Alaska, the temperatures during summertime sound very tempting to me and I love nature! Super speed, so I could travel anywhere in a blink of an eye! This one is hard, but I think it would have to be die cuts. I will say square corners (but round corners are also nice). I’m not big reader, but I love movies: Titanic, This Is 40 and The Great Gatsby. Paris, France... but who’s kidding, all of Europe. Literally, cause I’m this lazy, elasticity. 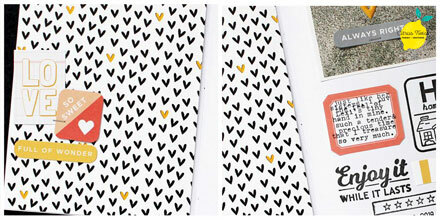 Patterned paper! I could fussycut everything. Square is fine with me. To be able to fly. Imagine all the places we could see if we had the ability to fly! Stamping. 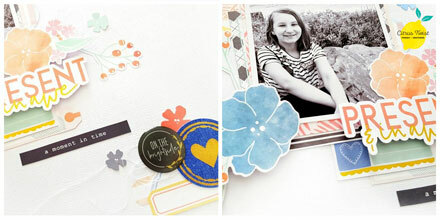 I love that you can reuse stamps as much as you want and they are versatile enough for any project. I'm not super particular about this (surprisingly! ), but I usually end up printing on glossy photo paper. P.S. I Love You. My favorite book (series) is Diana Gabaldon's The Outlander. With so many great books and movies to choose from, I'll list a movie I just watched again, The Hundred Foot Journey (mix culinary magic with romance [in France!] and it was a winner for me!). Scotland - my Scottish roots have called to me all my life. Time travel, for sure (with the ability to change outcomes, of course)! Die-cut ephemera over and over and over again. Glossy (not high-gloss), for sure. Hello and welcome everyone!!! Looking forward to seeing all of your creations.